Five Types Of People Who Need An Alarm System | Calgary Alarm Inc.
You might be convinced that you live in a safe neighbourhood, so the likelihood of your home being burglarized is very slim. Not so fast. It is not just the area you live in, but also your lifestyle and situation that determines how vulnerable you really are. There are certain types of people who are more likely to be victims of theft than others, so if your situation is in one of the categories to be described below, you might want to consider getting an alarm system. If you live alone and you are always out and about, your home is actually more likely to be a target. An observant burglar will notice your absence and take advantage. In such a case you need an alarm system to watch your home when you are away. Children should never be home alone, but the demands of daily life can be especially tough on parents (especially single parents). Even if your child is old enough to be alone or is being watched by a babysitter, a security system will still give you added peace of mind. It is no secret that elderly people are much more vulnerable. If the wrong people know that there is a senior citizen at home (and no one else) then they will see that place as an easy target. Even if there is an able-bodied adult at home, that person will have to leave occasionally. If the person’s movements are routine then it will be easy for burglars to pick the right time to strike. 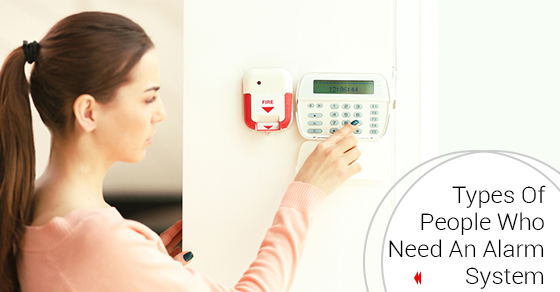 A security alarm will give that protection needed when you have to step out or you are alone. If you are an avid collector of items such as metals or antiques, you will need to have a security system. If someone knows you have these things then you are likely to be targeted. Even if they target your home for other reasons, they will have essentially hit the jackpot if they find your valuables unguarded. A security system is essential for deterring a would-be intruder and alerting the police as quickly as possible. If you are a business owner, you will also need to have a security system. The cost incurred is minor when you consider the long-term benefits of the protection offered. If you do not have a security system, then get in touch with us for a free consultation and appraisal. We have a variety of systems that can be tailored to suit your needs.